Preheat oven to temperature directed on brownie package. Line a 13x9 inch pan with non-stick foil. Prepare brownies using amount of oil, eggs, water called for on box. Two minutes before they are supposed to be done, pull brownies from the oven and sprinkle marshmallows across top. Return to oven for 2 minutes to soften marshmallows. 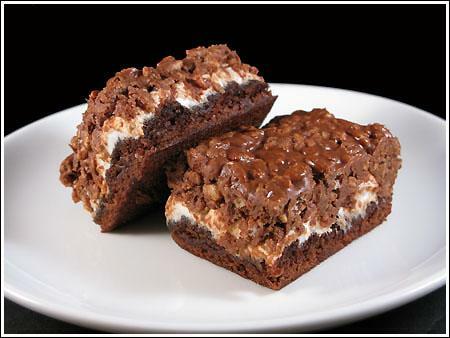 Remove from oven and spread soft marshmallows over top of brownies. Let cool completely on a wire rack. Prepare topping. In a microwave-safe bowl, combine chocolate chips, peanut butter and butter. Heat on high for 30 seconds. Stir and repeat until chocolate is melted and mixture is smooth. Add cereal and stir to coat. Drop spoonfuls of chocolate mixture over marshmallow layer, spreading as evenly as possible. Things will look gooey at this point, so don’t even think about cutting. Put the brownies in the refrigerator for a few hours to chill. Lift from pan and score into squares (about 16 or 20). This recipe halves well. Just cut everything in half (half a 19.5 oz box of brownie mix is 2 cups mix) and bake in a non-stick foil lined 8 inch square metal pan. Bake time will be about 22 minutes total.